Here you have another Mexican dish!! This one has to be my favorite dish of all times, I could eat them every week! Stuffed Poblano Peppers Mexican Style! So delicious!! I hope you like them! In a large skillet or griddle on high heat, roast the peppers on all sides for a few minutes on each side, until they get blisters all over. Once the peppers are ready, place them inside a plastic bag, close the bag, cover it with a clean kitchen towel, and let the peppers there to cool. Once the peppers are cold, now remove the skin from them. The skin will come off really easily, just rub the chili skin with your fingers and it should come off right away. After you remove the skin, now right on the center of each pepper make a small cut (about 1 ½ inch or 2 inches), the cut should be just big enough so you can stuff the peppers. Repeat these steps until you are done. Shred or dice one tomato and half a small onion. Cut the cheese in small pieces, or you can shred the cheese if you prefer so. In a large skillet, now heat up a bit of oil on medium high heat, and cook the ground meat for about 8 minutes or just until the meat is not longer pink, then add in a cube of chicken flavor bouillon, make sure to break down the cube really well so it will get well dissolved, stir, until the meat is well seasoned, then add in the shredded onion and shredded tomato, stir and continue to cook for about 7 more minutes or until the meat is cooked and there is no more cooking liquid in the skillet. Set aside to cool down. Place the tomatoes in a saucepan with plenty of water and cook them on high for about 10 minutes or until the tomatoes are soft. Then place the tomatoes in the blender together with a chunk of onion, one garlic clove, and one cube of chicken flavor bouillon, also add in about half a cup of water or chicken broth and blend until well blended. In a saucepan add a splash of oil, then add in the tomato sauce, and cook on medium heat until it boils. Once it’s boiling, taste the flavor add salt if needed and also add in a teaspoon of dry oregano, stir and continue to boil on low heat for five more minutes. I will stuff three of the peppers with cheese and the other three with the ground meat mixture. So stuff your peppers, add as much of the filling as you like. Then use toothpicks to keep the peppers well closed. Place half a cup of flour on a large plate, now cover the already stuffed peppers with the flour on all sides. Tap them a bit to remove the excess flour. On medium heat, heat up plenty of oil. Separate the egg whites from the egg yolks . With an electric mixer, beat the egg whites until thick and fluffy (for about 3 minutes on high). Then add in the egg yolks together with one tablespoon of flour and salt and pepper to taste. Beat on high until everything is just well incorporated. Grab a pepper (remember they are already floured), Dip the pepper in the egg mixture and make sure the pepper is well coated with the egg mixture on all sides, (the egg mixture is really thick and fluffy, so you might need to use a spoon to help you cover the peppers with the mixture) Tap to remove the excess egg mixture then transfer the pepper to the hot oil, and cook for a few minutes on each side. You want them to get nice and golden brown on all sides. Once the pepper is done, remove it from the oil and place it on paper towels to absorb the excess oil. 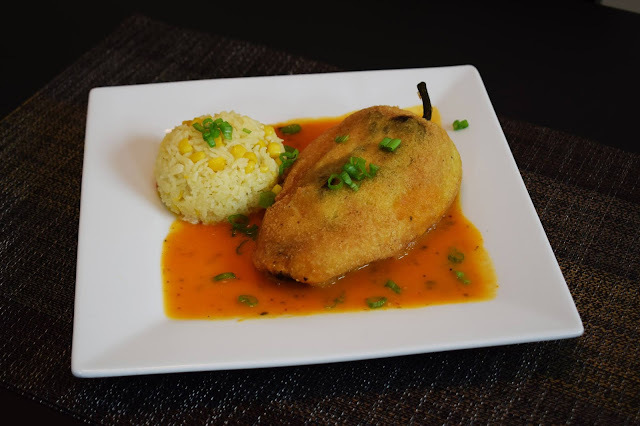 Keep on repeating these steps until you are done..
Add some of the tomato sauce on your plate, top it with a Stuffed pepper, serve with some white rice, garnish with green onions and more tomato sauce on top!